Congratulations: You’ve unwrapped, purchased, or otherwise braved wait times to pick yourself up a brand-new iPad or iPad mini this holiday. But before you get to playing with your new device, you’ll probably want to set it up. Thanks to iOS’s step-by-step activation process, Apple’s made it pretty simple to get started; but just in case you need some extra help, we’ve put together a comprehensive guide to your new iPad, activating it, transferring data from an older tablet or your computer, and some suggestions for exploring its new features. Welcome to your iPad. Apple’s tablet packs in all sorts of magic depending on what model you’ve received: If you have an iPad with Retina display, you’re looking at a device with a 3.1 million pixel screen, dual-core A6X chip with quad-core graphics, a Lightning connector, LTE service, two cameras, and up to 64GB of storage; if you have an iPad mini, your device also has a Lightning connector, LTE service, cameras, and up to 64 GB of storage—but it runs a dual-core A5 chip. Though the iPad mini is smaller and lighter than the iPad—weighing .7 pounds to the iPad’s 1.5—they both sport the same buttons and ports. We’ll walk you through these buttons, calling out differences where they appear. The iPad and iPad mini both have a standard 3.5mm audio jack on the top of their casing to let you listen to music. You can use several types of headphones with the iPad, including the Apple earbuds, or alternatively you can use Bluetooth headphones. If you plug in headphones that have a built-in microphone, the iPad senses the mic and allows you to use it with apps that have audio-recor¬ding capabilities. Otherwise the iPad uses its built-in microphone to record sound. The iPad and iPad mini’s internal microphone is on the top center edge of the device, right above the front-facing camera. You can use it to record audio in any app that supports audio recording. Unless you’re using an external microphone, you’ll use this mic for video chatting, recording voice memos, talking to Siri, and more. You can also decline or silence alerts and alarms with the On/Off button; press it once to silence an incoming alert. This 1.2-megapixel camera can shoot 1280-by-960-pixel stills and 720p HD video (1280 by 720 pixels). Apple designed the front-facing camera primarily for using FaceTime and snapping quick self-portraits. The iPad and iPad mini don’t have a tactile keyboard or many hardware buttons; instead, you use its LED-backlit Multi-Touch glass display to read books, surf the Web, compose email messages, navigate apps, and change settings. The screen is made from optical-quality glass, which makes it highly scratch resistant. It also has an oil-resistant oleophobic coating that makes it easy to wipe off smudges. The iPad’s screen is 9.7 inches with a resolution of 2048 by 1536 pixels—at 246 pixels per inch, Apple describes it as a Retina display, meaning that the pixels are too small to distinguish with the human eye. If you have an iPad mini, you’re looking at a 7.9-inch screen with a resolution of 1024 by 768 pixels (163 pixels per inch). The only physical button on the face of the iPad and iPad mini, the Home button provides a variety of shortcuts for accessing apps and operating system features. SINGLE-PRESS A single-press of the Home button can have several results, depending on what you’re using the iPad mini for at the time: If the iPad is in sleep mode, pressing the Home button wakes it; if you’re in an app, it returns you to the home screen; if you’re on a subsequent home screen page, it returns you to the first page; and if you’re on the first home screen page, it brings you into the iPad’s Spotlight search mode. SINGLE-PRESS AND HOLD Press and hold the Home button for at least two seconds to activate Siri. DOUBLE-PRESS When the device is locked or in sleep mode, a double-press of the Home button wakes your device and brings up the Music controls. In active use, it brings up the multitasking bar, showcasing your active apps. Speakers line the bottom edge of the iPad and iPad mini. The iPad has a single mono speaker to the right of the dock connector, while the iPad mini contains two small stereo speakers. They play anything that makes noise on your iPad, including music, video, or app sounds. You can also hook up the iPad mini to third-party speakers using the headphone jack, via Bluetooth, or via AirPlay, Apple’s wireless audio and video feature. The iPad and iPad mini use Apple’s new Lightning dock connector to connect to your computer and other accessories. The connector is reversible, so you can plug it into your device in either direction. Unfortunately, if you have older iOS device accessories that sport a 30-pin dock connector, your iPad won’t work with those times unless you get an adapter. When plugged into its included power adapter, the iPad can charge while awake or asleep. Your device will also charge when plugged into newer Macs and PCs, though charging will take longer. Older computers without high-powered USB ports will only charge the iPad mini when it’s in sleep mode; when awake, it displays a “Not charging” message in the status bar at the top of the screen. The iPad and iPad mini’s Wi-Fi + Cellular model can operate on multiple cellular Internet bands: various bands of the LTE cellular data standard, HSPA+, DC-HSDPA, GPRS, EDGE, CDMA-EvDO, and HSPA. 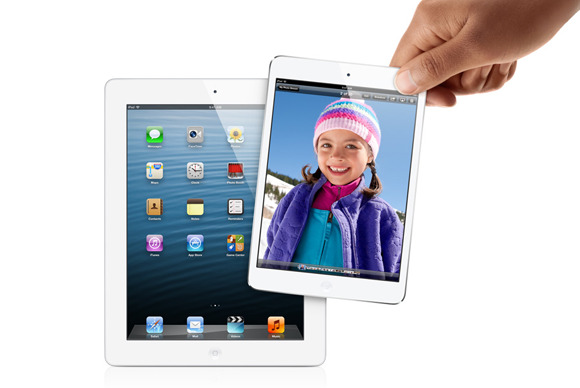 Major U.S. partners for the iPad and iPad mini include AT&T, Sprint, and Verizon. When purchasing a Wi-Fi + Cellular model, you must choose which provider you want, though you don’t have to sign up for a contract plan. The iPad comes contract free, allowing you to pay for service month to month. The iPad needs a micro-SIM card (the iPad mini needs a nano-SIM) to connect to a cellular provider. Without it, you won’t be able to access cellular Internet, only Wi-Fi. This SIM card comes preinstalled, though if you go abroad you can also pick up a SIM from a supported cellular carrier. If you need to install a SIM, or access your current SIM card, you can remove it by sticking one end of a paper clip into the hole next to the SIM card slot, visible on the left side of the device. You can set the iPad and iPad mini’s Side Switch—located on the right side of the tablet near the top—to lock the screen orientation or to act as a mute switch, depending on your preference. To set this, go to Settings > General, and then tap Lock Rotation or Mute in the “Use Side Switch to” section. If you choose Lock Rotation, toggle the screen-rotation switch on the side of the iPad to expose the orange dot, and your iPad stays in either landscape or portrait view, regardless of how you’re handling it. When the rotation lock is engaged, a small icon showing a lock with an arrow around it appears on the right side of the status bar near the battery icon. If you select Mute in the settings screen, the switch controls the iPad’s Silent mode, which mutes alert noises. Be advised that you can still hear the audio from music and videos from the device’s speaker when the iPad is in Silent mode. Directly below the Side Switch is a rocker button for volume. Press the top of the rocker to increase volume and the bottom rocker to decrease volume. (In the Camera app, the top rocker also functions as a physical camera shutter button.) In the Settings app, you can choose whether these buttons affect only noises from an app, or whether they control systemwide sounds as well.